Have you ever hosted a home party? For those of you open to the idea, home parties offer you a great way to connect with friends, family, neighbors and co-workers. And of course provide you with a simple way to earn some great profits. You can even have other's host parties for you in return for free gifts they will greatly appreciate. With Personal Touch personalized gifts, you will offer exactly what thoughtful gift buyers are looking for! Personalized gifts that are both cost effective and appreciated by everyone! 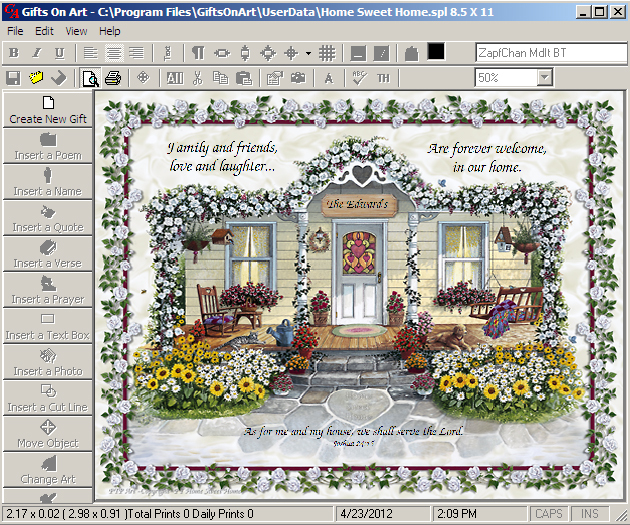 Using Personal Touch Gifts on Art software: Press the "Create New Gift" tool which allows you to select the customer's art background from a listbox. 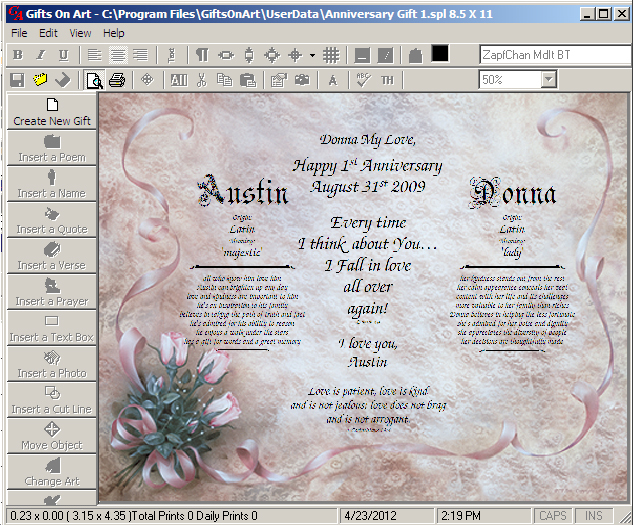 Press one or more of the left side tools to create the desired gift: Insert a Poem, Insert a Name, Insert a Quote, Insert a Verse, Insert a Textbox or Insert a Photo. Create appropirate gifts for everyone! Men, women and kids too! The following screen-prints will give you a good idea of the type of gifts you can create using Personal Touch Software. Note: this gift includes the customers first and middle name with meaning and origin for both. This is a very popular gift for couples of all ages and every occasion that celebrates love. Wedding gifts, anniversary gifts, valentines day, birthdays and just because. 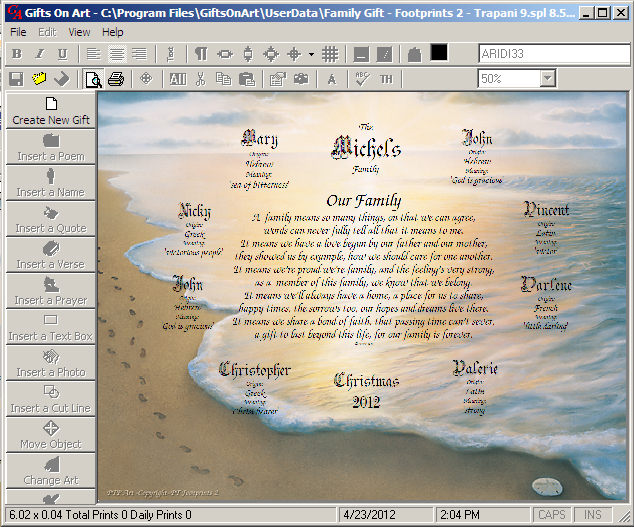 This gift combines a Poem in the center, a Textbox top center, and First Names with meaning and origin surrounding the poem. You can fit as many names as will fit on the 8.5x11 art. 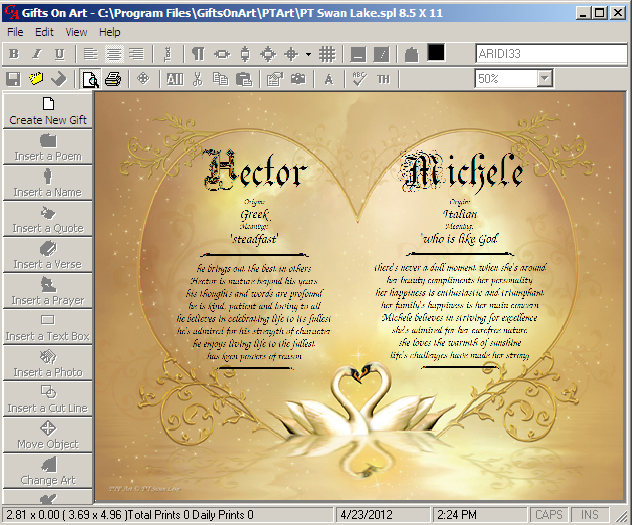 You could charge a base price for this gift such as $10 (the cost of a poetry gift), plus $2 to $3 per first name. e.g. $10 + 9 names x $2 = $29 just for the personalized art print that cost you 45-75 cents each. This same type of gift can be created using any of the PT art backgrounds, providing you with unmatched creative flexibility. 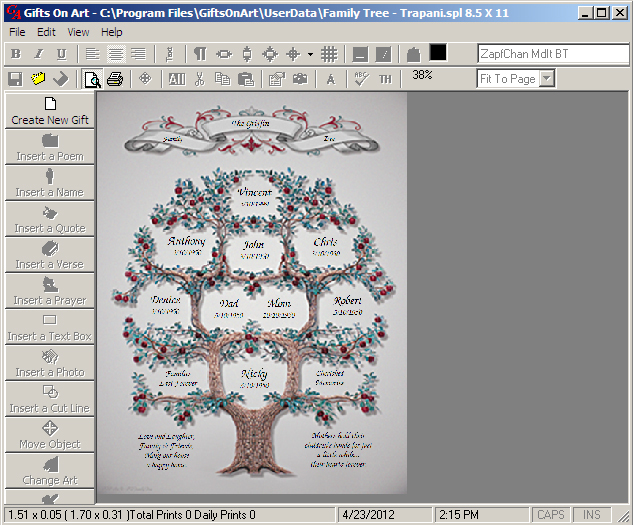 This is a free form gift allowing you to type whatever you like in addition to the names and DOB, you can add quotes, verses or proverbs as shown at the bottom. You can optionally insert each of the family member's first names along the stone walkway. Baseball or Softball Team Gift. Includes a poem, first name meaning and a famous quotation. This literally took two minutes to create and you can save it as a template so you can create the same gift for other customers in less than one minute. 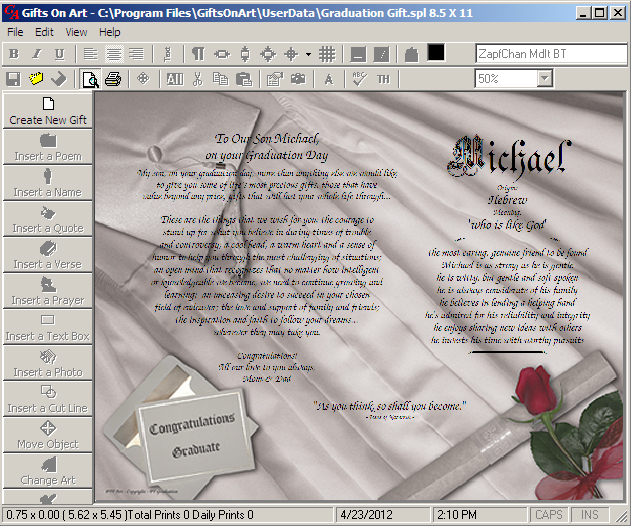 Includes a poem, the first name meanings for the couple, and popular bible verse. Find out more, request a sample gift or get started today.